Since strategy is not much use without a tactical component, I turn my attention in this post to tactics. My current working model includes three tactics: Employ subliminal messaging, Use unpredictable rewards and Use the sentinel effect. Today’s post focuses on the first of those three, subliminal messaging. Making health addictive is really about harnessing the power of our fascination with mobile devices, particularly smartphones. We check these devices up to 150 times per day. What if we put a personalized, relevant, motivational and unobtrusive message in front of you some of those times? Could we induce permanent behavior change? I am searching for examples of these customized mobile, personalized messages and any resulting behavior change, so if you know of any, please let me know. The term ‘subliminal messaging’ has its roots in the advertising industry. When I was a teenager, I remember stories about psychological experiments where advertisers would splice still frames of product images or messages into unrelated film clips. Watching the film, the story went, you’d never actually see those images or messages, but they would subliminally imprint on your mind and influence your behavior. Another common use of the term is to refer to subtle visualizations in various advertising imaging that allegedly speak to the subconscious. A Google search will show you many examples, most with some sort of sexual double entendre. Let’s think about how we might use this tactic to motivate healthy behavior. While getting someone’s attention with a colorful, catchy, fun, attractive or useful message of some sort, you’d slip in a health-related message. This tactic is an implementation tool for the strategy Make it About Life. I have two examples to illustrate this tactic applied to health care. The first is to review the impressive work of the American Legacy Foundation’s Truth campaign. The current home page is a terrific example. To convey the message that cigarette smoke contains harmful chemicals (in this case methane and urea), there are videos illustrating, in grand urban settings, these messages using large stuffed animals. There are accompanying Twitter hashtags and a tool at the bottom of the page to allow visitors to build and disseminate their own video. The work is amusing, edgy and takes full advantage of viral marketing. Since the messaging is aimed at teenagers, the context of bathroom humor is completely relevant. This campaign (and others like it illustrated on the site) serves to educate teenagers about important aspects of smoking in a fun way (who would want to smoke if cigarettes contain chemicals that are found in animal excrement? ), BUT never does the content lecture, talk down to or browbeat the viewer regarding whether they choose to smoke or not. The second example is from our own work at the Center for Connected Health. 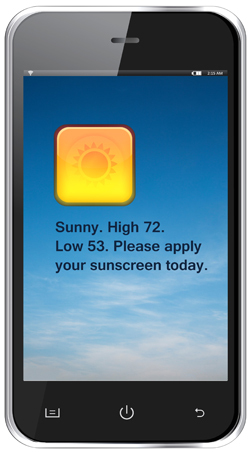 It involves a study we did a while back to test the impact of text messaging on sunscreen adherence. The headline that came out from the study was that a daily text message reminder was a powerful motivator of adherence (about 60% of the time compared to about 10% in a control group). What is even more relevant to this post was the design of the messages. Each morning, our participants had a text message delivered sharing the weather report and secondarily, a reminder to apply sunscreen. In exit interviews, the most interesting thing was that study participants told us the thing that kept them coming back was the weather report. They didn’t really pay attention to the sunscreen adherence message. They didn’t object to it, but it didn’t really strike them either. Pretty good adherence rate for a forgotten message. I think you see where this is going now. By designing health-related messages so that they apear within something that is either funny, inspiring or just plain useful, it seems we can have a greater impact than messages that threaten, scold or embarrass an individual. I’m talking about the type of messaging that has, over the years, led so many of my dermatology patients to say to me, “Please don’t yell at me because I got a sunburn.” I confess, I never yell at patients, but the feedback is that we need to message better. ← Two Strategies for the Integration of Patient-Generated Data into the EMR. Which Road to Travel? Thank you for your insights. Always good to hear from you. Hope all is well. Cant thank you enough for pointing this out. I had not seen it. very interesting. A great post. Blended delicately, neuroscience, marketing and advertising can produce the sweetest pill that preventive care of today could wish for. A while back at my company we coined the term “Counterising”, for counteracting advertising. This came about as a result of trying to formulate an effective evidence-based model to encourage a healthy lifestyle in the field of chronic disorders. Needless to say implemented properly insight of this nature offers a tremendously healthy ROI. Why else would companies such Coca-Cola & McDonalds spend as much money as they do in successfully trying to encourage us to buy into their message and product?